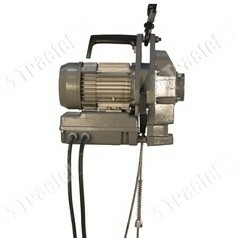 Minifor electric hoists are great hoists. Because the wire is separate to the hoist it makes the minifor a light weight unit for carrying up stairs and to heights. Simply hook the minifor onto the anchor point then feed the wire into the machine and attach the back stop. In addition, the minifor tends to be a faster unit than the chain hoists and it can also be used for pulling. We stock the 300kg and 500kg units, mot have radio controlled pendants though some are wired.